Disclaimer: if you are easily disturbed by the sight of dead fish, do not pass go and instead click here. 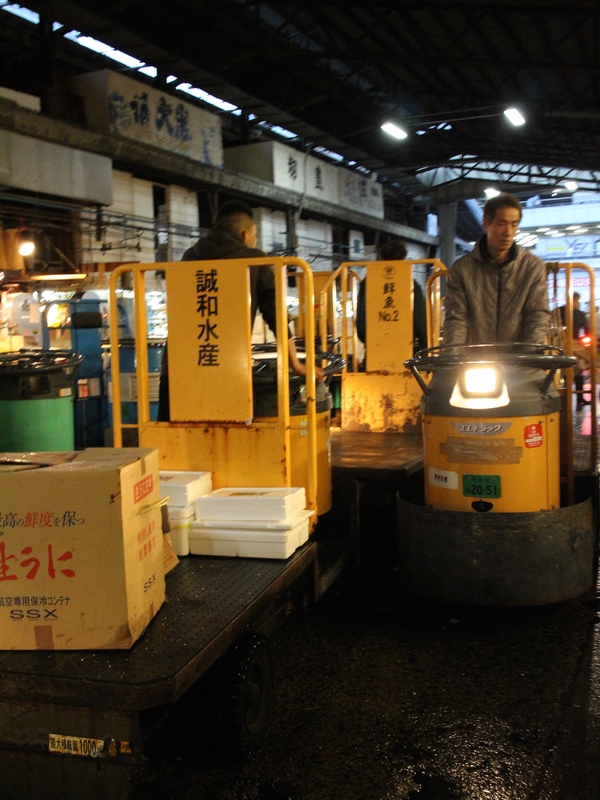 The plan: get to the Tsukiji Market at 4am. The challenge: the earliest trains run at 5am. The solution: sleep at manga cafe for three hours until they open. 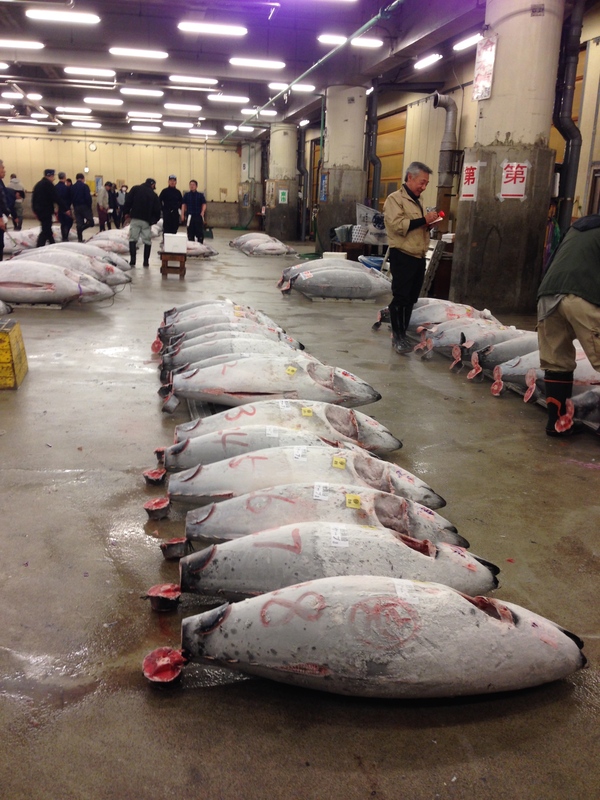 The Tsukiji Market is one of Tokyo’s largest wholesale market for fish, seafood, fruits and vegetables, and is the premiere place for all the high ballers to bid on prized giant tuna. The auctions happen daily at 5am, and are open for public viewing to the first 120 people in line for free. And when things are free, that’s where people will flock, myself and Simon included. Now, on to the manga cafe: it’s basically a manga library that allows you to rent a mat, cubicle, or desk and chair for a couple of hours, with access to more shelves of manga than I ever thought possible. 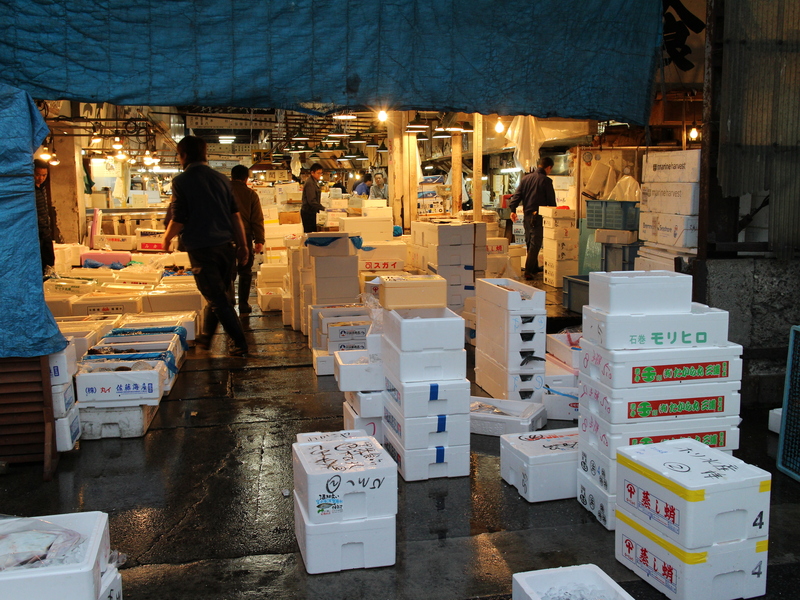 In other words, it’s manga heaven for some, but for us it was the cheapest way to lay our weary heads down and wait out the hours until the fish market opened. We had just arrived at the cafe and were about fork over money for three hours in a desk and chair, when a tiny voice behind us stopped our course of action. “Are you guys going to the fish market?” We turned around and were met with a young mousy girl who smiled at us behind her glasses. “I’ve been looking for this place for an hour!” she said exasperatingly. Yes we are, we told her. She proceeded to tell us the horror story about how her friend’s friend a few days prior had arrived to the fish market at 3am only to find she was too late. Her other friend upon hearing this, went at 2:30am the next day and was able to make the cut. It was now 12:45am. Simon and I looked at each other. The manga cafe was extremely stuffy and the thought of getting an unrestful few hours of sleep at a desk was unappealing. Based on this new information and already delirious from being awake since 6:30am, we decided to ditch the manga cafe idea. “Mind if I tag along with you guys?” she asked pleadingly. Sure, we said. And that’s how gained a new friend for the night. 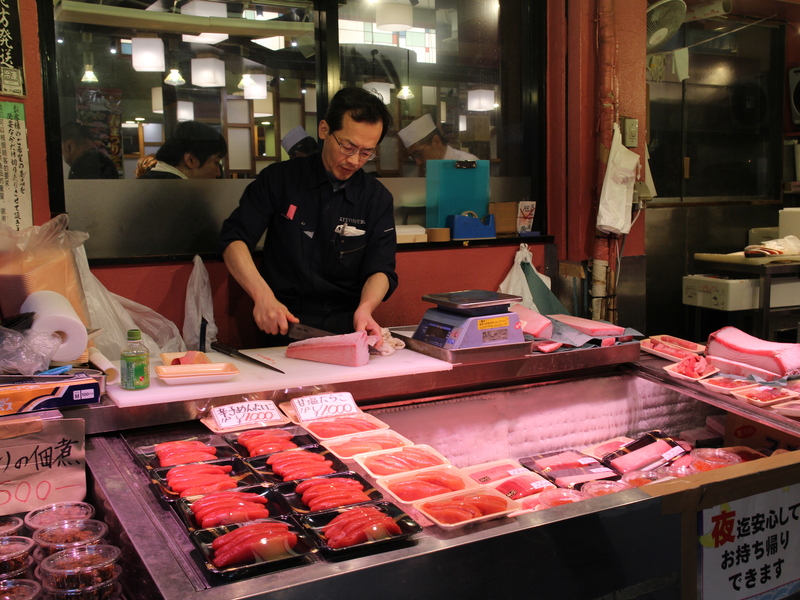 The Tsukiji Market is next to the Ginza district in Tokyo’s Chuo ward. This was our first time in the area, and while it was past midnight, with shops long since closed, everything was just as glittery as you can imagine. The streets were lined with high end designers and luxurious brands – it reminded me of Rodeo Drive in LA. The wide sidewalks were so clean we even joked about setting up shop to take a nap. The three of us found a convenience store in between two high rises – a haven since it provided food and a restroom for us vagabonds. Unsure of where else to go, we plopped down on the plaza steps. Illuminated by the fluorescent glow of the convenience store, we talked. What brings you to Tokyo? Her name was Von and she was a college student studying abroad in South Korea. She had landed in Tokyo just a few hours ago, and this was the start of a long weekend trip for her. She talked about growing up in Utah, the places she’d been, her studies in college, and her traveling adventures. There was an innocent naivety about her, something only someone that young would have. Yet she also had a fearless sense of independence that had been strengthened by her world exploration. In turn she asked us we were from and where we were going. As Simon listed off our plans for the next few weeks, her eyes widened in surprise. “How do you have so much time?” she asked inquisitively. And when Simon told her we had quit our jobs, her jaw dropped open in disbelief. Her young ears couldn’t comprehend that we willingly exchanged steady paychecks for a temporary lapse of income. Sometimes I don’t believe it either. 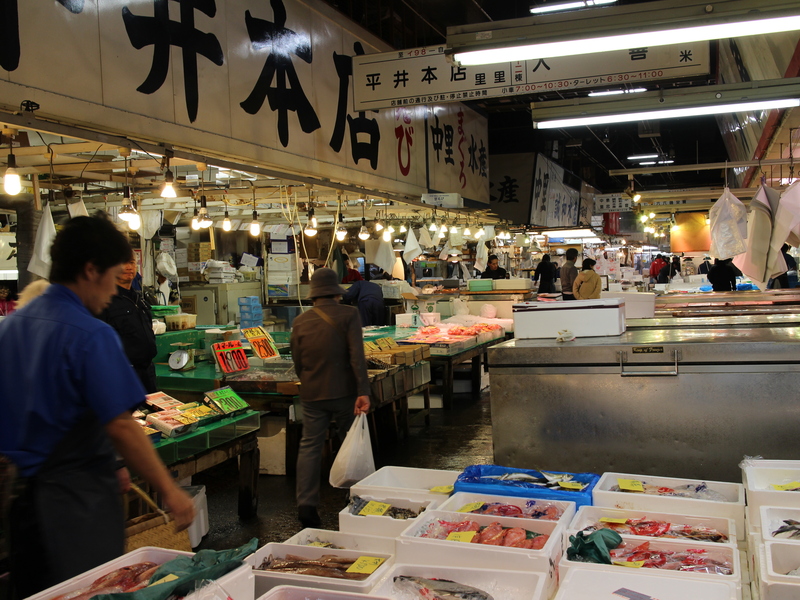 We decided to head over to the fish market at 2am just in case. To our surprise, there were a couple of people that beat us to the punch of being first in line. Within five minutes, ten other people stood in line behind us, with a handful more to follow. 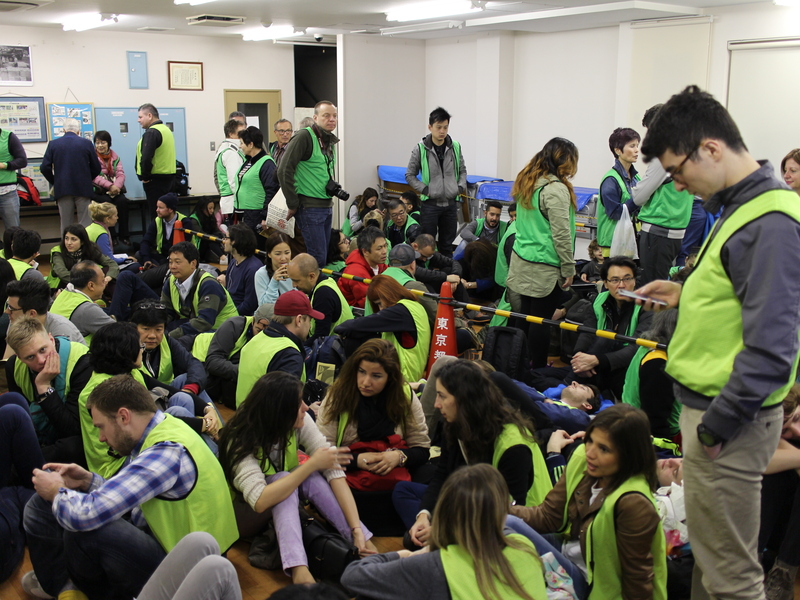 At 3am we were handed neon yellow safety vests and led into a holding room to wait in anticipation for the next two hours. The time passed slowly and this was sure a lively crowd of tourists for it being so early in the morning. Aside from some chatterboxes, people found interesting ways to stay comfortable and to sneak a sleep. I drifted in and out of consciousness with my body pressed awkwardly against the wall and eventually found myself in corpse pose on the hardwood floor – not the most relaxing without a yoga mat. I was rudely awakened when Simon nudged me with his foot. My eyes fluttered open to the sight of everyone towering above me. It was time for the auction to begin! There we were in our neon safety vests herded under the protective care of the shepherds (or rather the fish market officers in blue uniforms) as we gingerly crossed the expansive lot from the holding office to the large warehouse where they held the prized tuna and other fish. The air reeked of the sea and other fun fishy smells, while mopeds, fork lifts, and trucks zig zagged all around us with no rhyme or reason like a crazy real life version of bumper cars minus the bumping. I literally felt like a deer in headlights. Seeing the neatly lined rows of frozen headless, tailless, and finless tuna in the cold warehouse was kind of a sad sight. 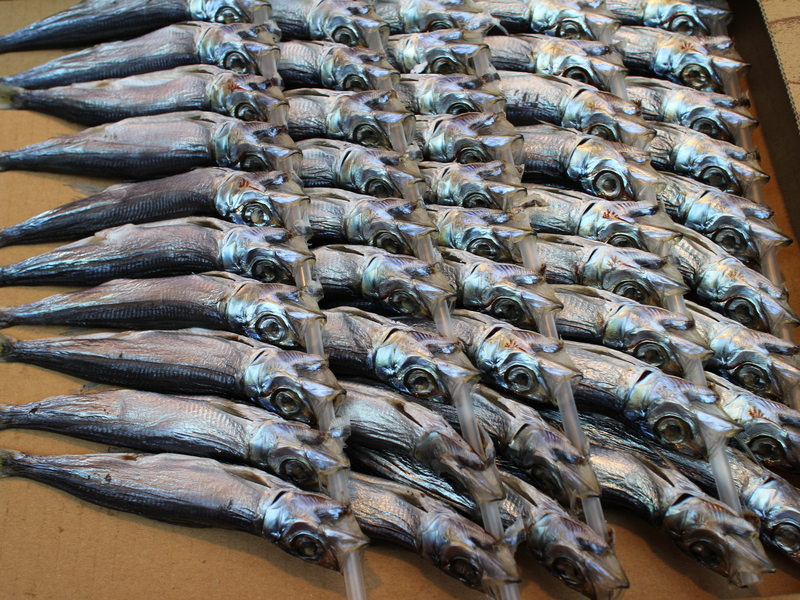 They were almost unrecognizable as fish but instead resembled nuclear bombs. The bidders made their rounds poking and prodding at the carcasses with their hooks, shined flashlights at some of the exposed pink flesh, and gave them an all around thorough inspection like my annual visit to the gyno. And then the auction began. With the ringing of a handbell in the most enthusiastic manner, the auctioneer donned in a cap, navy utility suit and rubber boots stood on top of a soap box and started the auctioneering process, as did five others. The cold warehouse echoed with the sound of the ringing handbells which soon ceased and gave way to the auctioneers doing their fast talking and money dealing. In a matter of minutes it was all over and although I couldn’t understand what the highest bid was I am pretty sure it was a hefty price tag. The experience was anti climatic and Simon and I were both left thinking, is that it? Pulling an all nighter for a mere 20 minutes of watching dead fish being auctioned didn’t seem to pay off. Perhaps we were suckered into a tourist trap, one that we willingly took bait to, which lead to our untimely demise. I guess we have something in common with the tuna. We stumbled out of the warehouse and the sky was now aglow with the sunrise. It seemed like the last couple of sleepless hours had been a hazy dream. 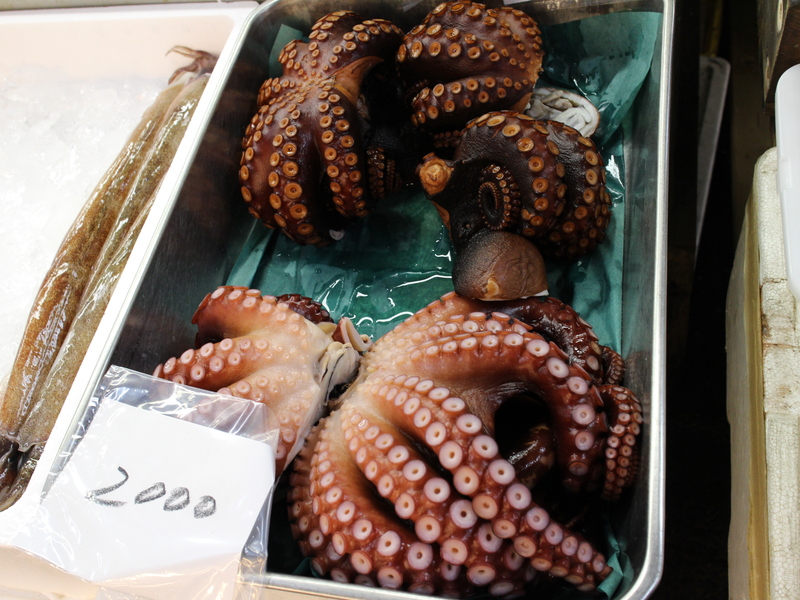 The three of us lingered around the fish market for a bit to check out the produce and neighboring eateries, which already had lines of hungry tourists forming outside. None of us wanted to wait several hours for food. Von wished us a pleasant trip, as we did to her. And, in the same way she appeared to us just a few hours before, she quickly disappeared into the crowd and we never saw her again. You’d think that after being awake for the past 24 hours, the first thing we’d want to do was to knock out. But when one is in Tokyo, one must have a nigiri breakfast, complete with prized tuna served up several ways: roll, regular, toro, broiled toro, medium, and chopped, all before 7am. If that’s not a breakfast of champions, I don’t know what is. Oishi!